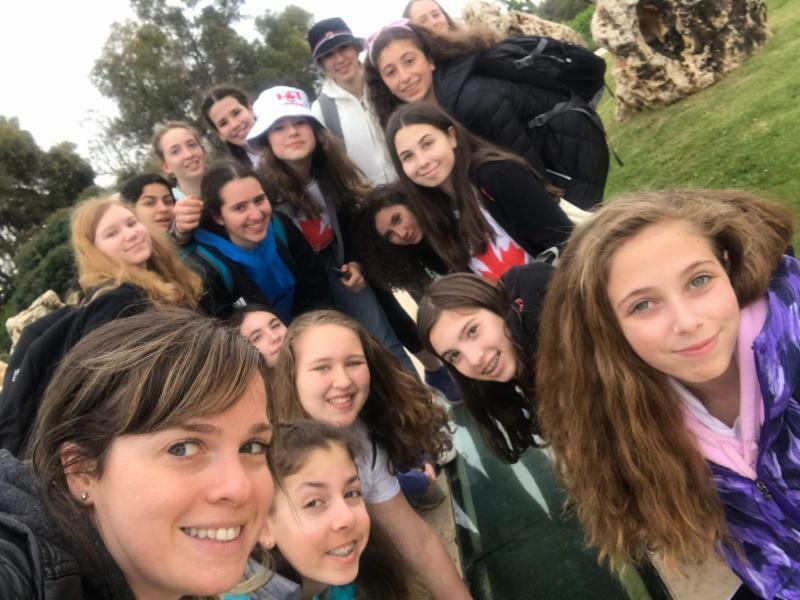 After making lunches – each student made a lunch to take with them for the day – we headed to the bus for an 8:40 a.m. departure to Beit Vancouver (BV) in Kiryat Shemona. BV is a community centre which the Vancouver Community and the Jewish Federation generously support – it provides a plethora of programming for kids in need – Kiryat Shemona is not a wealthy city and Vancouver’s support of various programs is key to creating opportunities for youth and those at risk to flourish. One of the goals of our trip is to show our students how Vancouver supports other communities philanthropically and to encourage that empathy and sense of caring. Many of our own families support BV through the Jewish Federation and directly – it was fun for all of us to see Emma Silber and Tanner Barnett – two of our Grade 8s – with their names on the donor board. 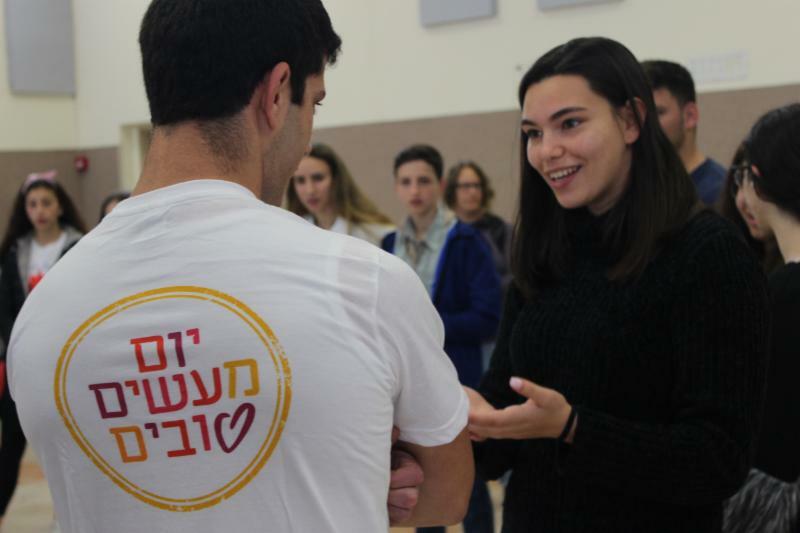 So many students have made contributions through philanthropic Bnei Mitzvah projects or through the MVP at VTT – it is great to see students make personal contributions of their time and money to develop these habits of caring for others. 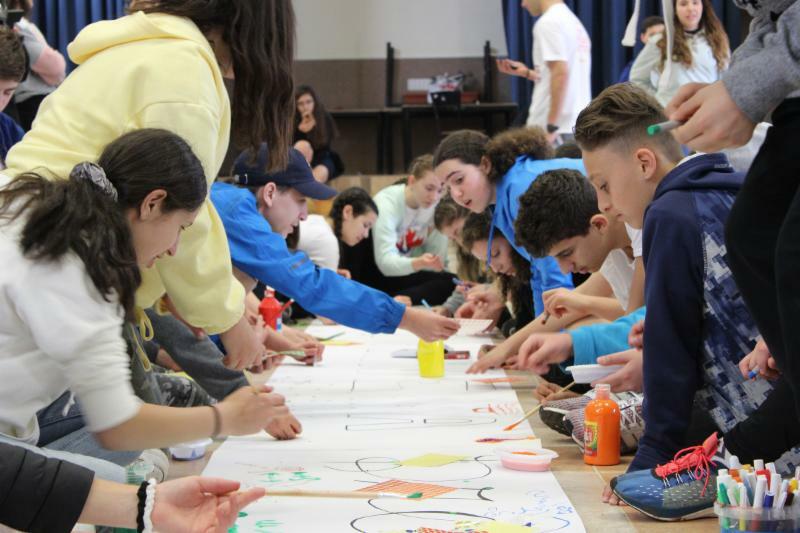 At BV, there were about 20 Israeli teenagers led by our Shinshin for next year, Camille, and with the BV staff they organized ice-breaker games for the students. We were in a small auditorium – so maybe 80 of us in total – and I could not help think that this was a time I wished I could be my like father and turn my hearing aid off! One of the fun activities they did was to dream… and to write their dreams as leaves on a wishing tree (a real tree with a fake name). Around 11 a.m. we made our way back to the bus and drove to Har Vagai school. 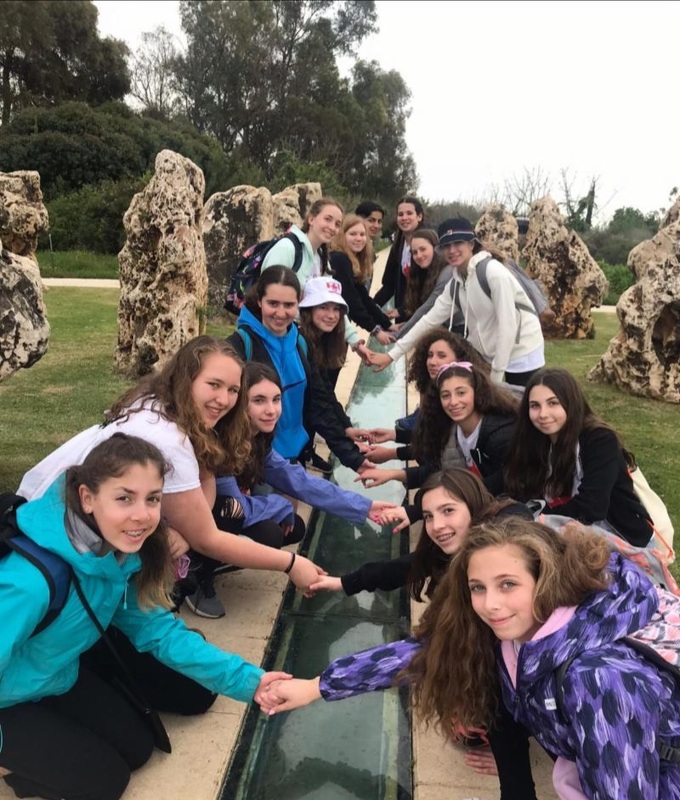 At about 11:15 a.m. a balagan broke out when our Israeli hosts began appearing and kids starting running, hugging, and oh yes, shrieking. One of the good powers of social media applications is that the kids knew each other already – full recognition, no introductions needed – it felt like you were watching family re-unite who had not seen each other for a millennia. All the kids then went off by the fish-filled stream and mingled and chatted and did whatever people do when they meet with family. Around 1 p.m. everyone made their way to a large multi-purpose room where we shared videos of our respective schools and heard greetings from the Har Vagai Principal, Ravit Rosenthal and Teacher Coordinators Uri and Stav – we all felt most welcomed by the staff and students. There were lots of snacks and drinks too, which of course was the perfect lead in to lunch. Lunch led into a scavenger hunt as the students played together and explored the school. Har Vagai is a huge campus (thus the fish-filled stream) with many buildings to house its almost 1000 students from Grades 7 – 12. This was followed by the exodus – which is when the students go home. 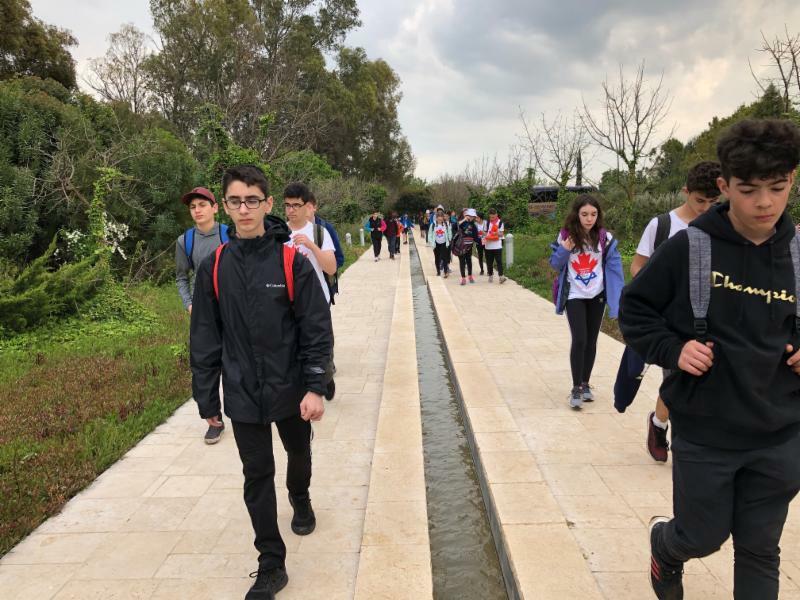 As the school serves a scattered population from different kibbutzim and other areas there is a flotilla of buses that arrive to take students home – tomorrow our students join the brigade as they will be going home with their hosts. I am interrupting this recount of the day as I know some of you want a weather update – I just want a change (that is the update). Sunshine is my reason d’etre – and between the weather and the breakfast salad, well, it is a good thing we have a great group of kids and new people to enjoy! We have put in a request for sunshine (we filled out all of the paperwork) and so good times are coming (no really, tomorrow will be sunshine and lollipops). 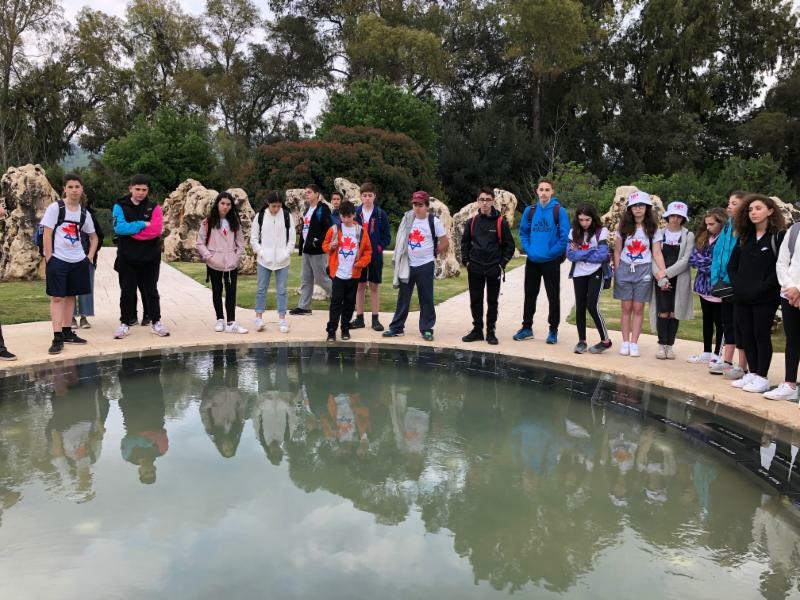 After the exodus (yes, I do know Pesach is coming and I am not trying to make parallels) our students walked the 15-20 minutes it takes to reach the Helicopter Disaster Memorial. In 1997, 73 IDF soldiers died when two transport helicopters collided near Kibbutz Dafna, which is right next to the school. The memorial is a beautiful and serene site with 73 stones erected around a round pool to which water is directed through a channel. The 73 names are written on black blocks placed under the water of the pool. At one edge of the site is the "Forest of the Fallen," a sombre cluster of 73 trees, one for each of the soldiers lost that day. After the students returned it was a good time to give them some "me" time for about 90 minutes. One thing about these trips is that there really is not much time for ‘self’ as you are surrounded by people all the time – for most, even during sleep – so personal space is at a premium. At 7 p.m. we all met to talk about our day. Matt Dichter took us through a meditation – he really does have skills! Lu Winters then led a conversation by asking the kids questions such as "what had surprised them so far" and "how they felt they have been doing in terms of their own personal responsibility". I was pleasantly surprised with the number of responses. If the students are tired they are doing a good job of not showing it – moods and attitudes are good – really good. There was one accident earlier this evening at the Helicopter Memorial. Miss Lane took a mis-step and fell flat onto her forehead – she has had her usual marvelous ‘can do’ attitude but we did insist she visit a clinic where they ensured her swelling was drained and stitches added – she has been a great role model for the kids – as she always is! Also, kudos to Matt today for speaking Hebrew to all of the Israelis and modeling taking risks and being vulnerable – he did pretty well with a few mistakes and he never waivered or stopped smiling. After our meeting it was finally dinner time – it was the same buffet as yesterday (same items, different preparation moment – at least hoping so). It was all very good once again and it sure seemed like the students were eating and enjoying themselves. As I write this – it is around 9 p.m. and I can hear the students outside doing what they do best – simultaneously having fun and making noise – it is actually a nice sound to hear – we want them to enjoy themselves. We have given them an hour until 10 p.m. – then it is lights out time. It is just 10 p.m. and we have had a power outage for the last hour which is affecting our ability to complete this update – for example, we cannot upload today’s video (I think we have two videos to share) – we will have to share those tomorrow – so look forward to lots of viewing time tomorrow – my phone has been a hotspot machine tonight so I am excited to see that 3G bill! Not quite the end to the day we wanted – the students are being troopers as there is no power (light) in their rooms. But the sun will come out tomorrow so all is good in the world!